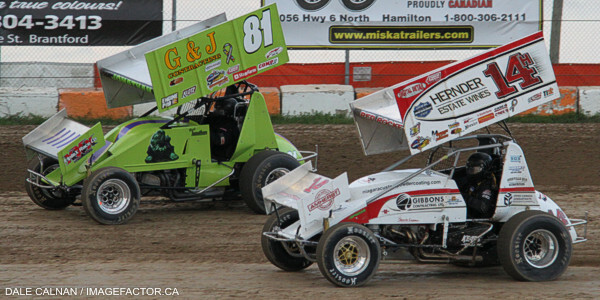 Ohsweken, Ontario – July 17, 2013 – Ohsweken Speedway’s 18th season of racing continues this Friday, July 19 when Jones Brown Motorsport Insurance and Evers Financial present Autograph Night, featuring the Corr/Pak Merchandising Sprint Cars, Affordable Towing & Recovery Thunder Stocks, HRW Automotive Mini Stocks, and Gale’s Auto Aftermarket Bombers. The Sprint Cars will get back to racing for championship points this Friday, following a special challenge event with the Empire Super Sprints last week. 2011 track champion Jim Huppunen leads the way in the championship chase, with 7 full points events left on the schedule. Jamie Collard, Glenn Styres, Mitch Brown, and Shane Ross make up the rest of the top 5. Chris Dickie was awarded the Thunder Stock feature win last Friday, and took over the points lead as a result. The top 5 has tightened up over the past few weeks, as Dickie holds an 8 point lead over Lee Winger, with Cory Turner 4 points behind Winger, Mike Thorne 10 points behind Turner, and Jim Lampman 2 points behind Thorne. A pair of rookies lead the way for the Mini Stocks. Alex Schuts picked up his 2nd win of the season last Friday, and took over the Mini Stock division points lead as well. Davey Boughton lost the points lead, but he’s still in the hunt, just 7 points behind Schuts. Jason Lungaro, Laura Hughes, and Steve Hess hold spots in the top 5. 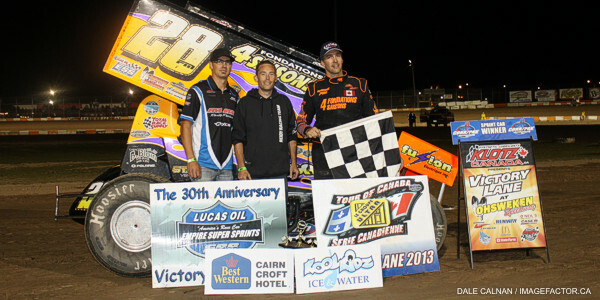 Dusty DeBoer took over at the top of the Bomber standings last Friday, after picking up the feature win. Jesse McDonald is just 1 point behind though, followed by Tim DeBoer, Max Chechalk, and Brady Longboat. About Evers Financial: Evers develops creative ways for their clients to grow and distribute equity among themselves and their heirs in a fair, tax-effective, and amicable manner. Evers Financial helps high net-worth individuals and corporations to see their “big picture”, and to put closure to unresolved questions. Evers Financial’s planning process is as unique as each family member – they analyze the specific details of each client’s wishes, then apply their many years of experience to develop and implement Practical Planning Solutions. Evers Financial clients often tell them that this process has provided them with a new sense of peace and satisfaction in their lives. Please visit www.Evers-Financial.com for more information. Ohsweken Speedway’s 18th season of racing continues this Friday, July 19 when Jones Brown Motorsport Insurance and Evers Financial present Autograph Night, featuring the Corr/Pak Merchandising Sprint Cars, Affordable Towing & Recovery Thunder Stocks, HRW Automotive Mini Stocks, and Gale’s Auto Aftermarket Bombers. Weekly Friday night racing at Ohsweken offers affordable, exciting, family entertainment just a short drive from many Mid-Western Ontario locations. Weekly Friday night racing adult general admission is just $12, while admission for seniors and students is $10, and kids age 12 and under are admitted FREE! Spectator gates open @ 6:00pm, with the first race taking the green flag at 7:30pm this Friday, July 19! Visit the new official Ohsweken Speedway website at www.OhswekenSpeedway.com and Feel The Excitement!